A dental implant is a revolutionary way to replace one, several or all teeth. It allows you to have the function and look of a completely natural tooth, serving as a permanent solution that can be maintained just like your regular teeth. You can also receive a crown, bridge or dentures in conjunction with dental implants depending on your situation. Treatment involves the placement of a titanium implant into the jaw. After time has been allowed for healing, your chosen restoration can be affixed to the implant. You probably weren’t born with the smile of your dreams. At our practice, you can choose from Invisalign®, traditional metal braces and early intervention that can prevent kids from requiring orthodontics in the future. Covering a range of alignment requirements, these options can be discussed at a complimentary consultation to determine what works best for you. Your front teeth are what everyone sees when you smile or speak. 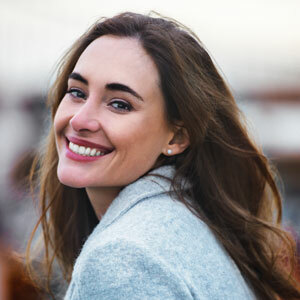 If they aren’t aligned as you’d like or have been discoloured, chipped or have other concerns, veneers may be an ideal solution. They’re available in laminated composite and porcelain materials for long-lasting, durable results. A cap or crown goes over the existing structure of a damaged tooth to give it strength and protection. A bridge anchors to neighbouring teeth, suspending a fake tooth into an existing gap. Both restorative options are simple ways to preserve existing tooth structure as much as possible. Philips Zoom whitening systems are well-known as an industry leader that gives different options providing brilliant results. You can choose from a quick in-chair procedure or a convenient take-home kit to brighten your teeth. If you have a tooth that’s been decayed, know that unsightly metal fillings are a thing of the past. The tooth-coloured fillings used at our clinic are mercury-free and will blend in perfectly with your existing teeth. If you have lines around your eyes, mouth or chin that you’d like to reduce or eliminate, we offer wrinkle injections that will give you a more youthful appearance. Our dentist takes your entire facial profile into consideration to help you achieve the desired results. Contact us today to learn more about cosmetic dentistry! We’re pleased to offer complimentary consultations.